(Story courtesy of the Mille Lacs Band of Ojibwe. Photo courtesy the Vikings.) 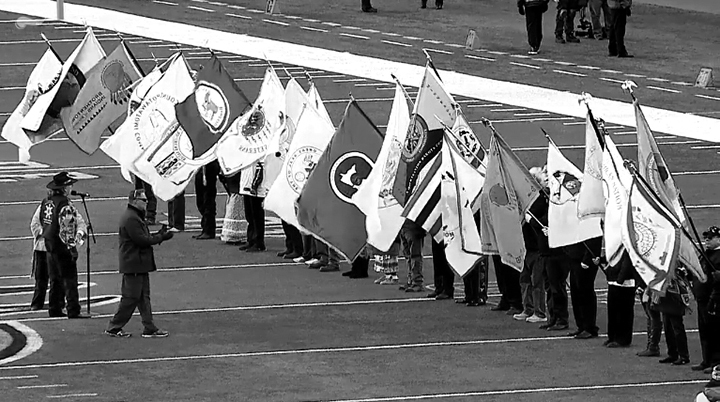 The Minnesota Vikings celebrated National Native American Heritage Month Nov. 22 at TCF Bank Stadium with a flag ceremony and a halftime show. Twenty-three flags from tribes located in Minnesota and Wisconsin were carried in the opening procession. Representative Peggy Flanagan (White Earth Ojibwe) sang the National Anthem. A pair of fighter jets flew over just as she reached the end of the Anthem. Jerry Dearly emceed the the halftime show, which featured Redbone Singers and Dancers. The Minnesota Historical Society (MNHS) has selected two recipients for the 2015/16 Native American Artist-in-Residence program. This is the second year of the program which is designed to help revive traditional forms of American Indian art. Each artist will serve a six-month paid residency to study the collections at MNHS and other institutions to aid in a better understanding of their respective art forms. They will also share their knowledge by developing community-based programming in their home communities. 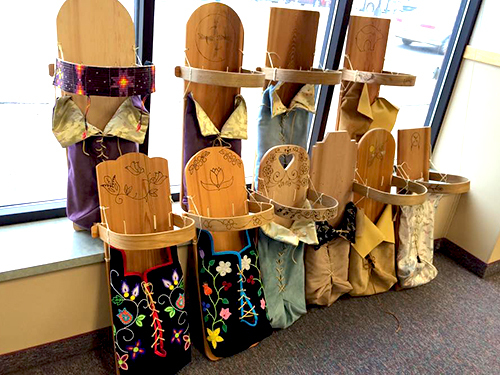 Denise Lajimodiere (Turtle Mountain Ojibwe) specializes in the art of mazinibakajige or birch bark biting. This art form is made by biting down on small pieces of folded birch bark to form intricate designs. Lajimodiere plans on studying birch bark biting in the collection and discovering how they were used as patterns for beadwork and quillwork. Holly Young (Standing Rock Sioux Tribe) focuses on Isanti/Dakota floral beadwork. The contemporary use of florals among Dakota beadwork is not as common as geometric designs so Young hopes she can bring more exposure to this artwork. The Shakopee Mdewakanton Sioux Community (SMSC) has donated $1 million to the University of Minnesota to fund three major projects relating to nutritional health in Indian Country. The gift is being made under the tribe’s Seeds of Native Health campaign to improve Native American nutrition nationwide, in which the university is a strategic partner. · A series of annual national conferences focused exclusively on Native American nutrition and food access, to be jointly convened by the university and the SMSC. The inaugural conference will be held in spring 2016 in the Twin Cities. · A publicly accessible, comprehensive, multi-disciplinary bibliography relating to Native American nutrition and a publicly accessible, searchable database of leading experts in relevant fields. The SMSC’s gift will fund the development and public launch of the two database while the university will seek additional funding for the later, ongoing maintenance of the databases. The Shakopee Mdewakanton Sioux Community (SMSC) recently announced the newest class of SMSC Endowed Scholarship recipients at the University of Minnesota. These first-year scholarship recipients include 20 Native American students from 17 different tribes. Local students are listed by name and tribe: Lucas Bratvold, Red Lake Nation; Jolene Chestnut, White Earth Nation; Laurie Harper, Leech Lake Band of Ojibwe; Wendy Jourdain, Red Lake Nation; Veronica Kingbird, Red Lake Nation; Crystal Littlewolf, White Earth Nation and Nathaniel Taylor, Red Lake Nation. Eight federally recognized tribes will collectively receive nearly $2.5 million in grant awards from the U.S. Departments of Education and Interior to bolster their educational programs and advance self-determination goals through the development of culturally relevant programs. William Mendoza, director of the White House Initiative on American Indian and Alaska Native Education, and Dr. Charles “Monty” Roessel, director of the Bureau of Indian Education announced the awards during the 7th annual White House Tribal Nations Conference. The grants are funded through the Department of Education’s State-Tribal Education Partnership (STEP) program, and the U.S. Department of the Interior’s Bureau of Indian Education’s Tribal Education Department (TED) program. The Leech Lake Band, Minnesota Chippewa Tribe, Minn will receive $200,000 from the TED funding. 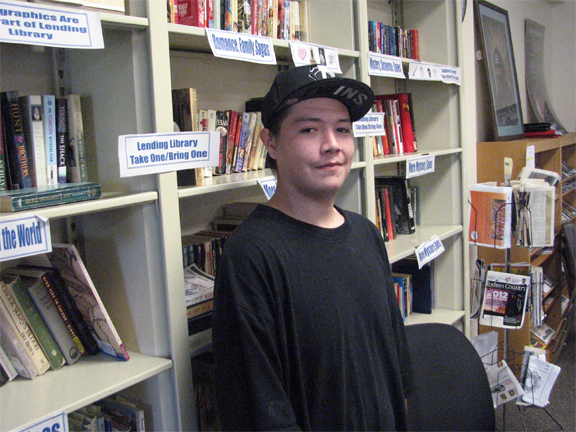 Other tribes awarded TED funding include: Sault Ste. Marie Tribe of Chippewa Indians, Mich. ($300,000), Mississippi Band of Choctaw Indians, Miss. ($150,000), and the The Muscogee (Creek) Nation, Okla. ($50,000). The following tribes will receive STEP funding. The Chickasaw Nation, Okla. ($500,000), Nez Perce Tribe, Idaho ($330,000), Coeur D’Alene Tribe, Idaho ($330,000), The Muscogee (Creek) Nation, Okla. ($318,463), and the Confederated Salish and Kootenai Tribes, Mont. ($287,769).